Attention all 8th grade chorus students who sang at the Phillies game…. Please report to Ms. Mulé’s room when the 8th period bell rings today. We will warm up and sit together. Again, this is ONLY for 8th grade chorus students who sang at the Phillies game. Good luck to the students performing in tonight’s concert. 6th and 7th grade boys & girls who plan to try out for ANY sport at KMS next year. Sports physicals will be done at KMS this Thursday and June 1, 4 and 5. They will NOT be offered again next year. Today is going to be a great day at KMS. We will cheer on the Graduating Class of 2018 during 4th period. We will also celebrate our amazing school as we get recognized for being redesignated as a school to watch. We are bursting with Kennett Pride! Attention 8th Graders, WANT TO MAKE A DIFFERENCE? Starting in August, Dr. Hritz will once again be offering The Leadership Course which will be held after school once a month throughout the year at KHS. This course is designed to develop and enhance student leadership skills with an emphasis on improving KHS. If you are interested in enrolling in this course, please email Dr. Hritz at jhritz@kcsd.org to request an electronic application. Applications will not be accepted after Friday, June 15th. Students will be notified over the summer regarding their status regarding the course. We have LEAD today during 8th period. End-of-the-year awards are just around the corner, and the 25 students in each grade who have earned the most Kennett Square‘s will be recognized as the pride student of the year. Today, Friday, May 25, is a power up day, which means every Kennett Square earned is worth double. Be on your best behavior today and tomorrow and try and earn a power up Square before the end of the year awards are decided. Good luck and show your Kennett pride! Mrs. Shannon has only received PIAA forms for 12 students! If you plan to try out for sports or cheerleading next year and want your physical done at school, please return the consent forms to Mrs. Shannon by Friday. Attention any 6th and 7th graders interested in trying out for Field Hockey in the Fall. There will be a brief informational meeting during lunch tomorrow in Mr. Robinson’s room D101. Please attend. Yesterday, we shared the good news of our Walk for Water funds being sent to Mozambique to help establish a clean water well. We thought we would be getting notification this summer that would inform us of the GPS coordinates as well as provide a picture of the well. Good news, Mr. Faiss has received notification along with a photograph of the wells location. All money raised by KMS has been sent to the Nacarôa Districts in the Nampula Province of Mozambique where this photograph was taken. KMS the Nacarôa Districts in the Nampula Province of Mozambique says thank you for helping to bring clean water to our lives! Congratulations KMS. Way to show your Kennett PRIDE! Continuing today we will have the 5th graders visiting from each Elementary school. Be sure to show your Kennett Pride. Mrs. Mancuso’s 3rd period Chorus will be singing for the visiting 5th graders today. Student’s in Mrs. Mancuso’s 3rd period Chorus need to report to the big gym at 8:50 today. If you were one of the 8th graders that was invited to visit your Elementary School in June, please be sure to turn in your signed permission slip to Mrs. Krieger in the Guidance Office. The deadline is today, Friday, May 25th. Thank you. Now for a short video on the history of Memorial Day! Have a nice weekend and a Great Day KMS! Yesterday, we shared the good news of our Walk for Water funds being sent to Mozambique to help establish a clean water well. We thought we would be getting notification this summer that would inform us of the GPS coordinates as well as provide a picture of the well. Good news, Mr. Faiss has received notification along with a photograph of the wells location. All money raised by KMS has been sent to the Nacarôa Districts in the Nampula Province of Mozambique where this photograph was taken. 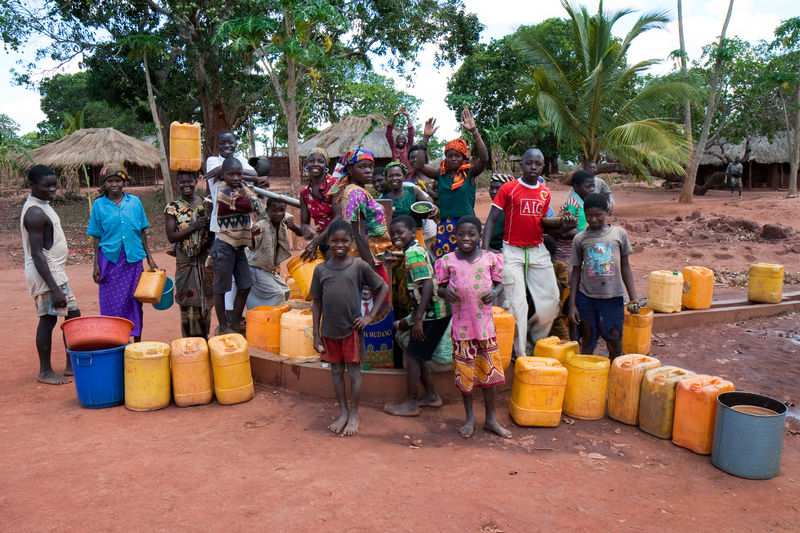 KMS the Nacarôa Districts in the Nampula Province of Mozambique says thank you for helping to bring clean water to our lives! Congratulations KMS. Way to show your Kennett PRIDE! We have some good news to report. This year will be our 4th year of Walk for Water. Two years ago, KMS and the 6th grade decided to make this event a charity walk to raise fund for Charity:Water. Current 8th grade student who were in 6th grade then donated at least a dollar and we ended up with a total of $880. Charity:Water builds sustainable wells in areas where people don’t have access to clean water – 663 million people fall into that category. It takes approximately 21 months on average to see exactly where the donation ends up. Mr. Finnegan just got word that the money was used to build a well in Mozambique. We should be getting a final notification that tells us the GPS coordinates and a picture of the well in early summer. Additionally, current 7th grade students who raised similar funds last year have been notified that their funds were sent to Mozambique as well. Congratulations KMS. Way to show your Kennett PRIDE! Continuing today and tomorrow we will have the 5th graders visiting from each Elementary school. Be sure to show your Kennett Pride. If you were one of the 8th graders that was invited to visit your Elementary School in June, please be sure to turn in your signed permission slip to Mrs. Krieger in the Guidance Office. The deadline is tomorrow, Friday, May 25th. Thank you. Any 8th grade student interested in trying out for the Kennett High School Golf Team, please sign-up in the main office. Sign-ups will run through today. More information and a meeting as to the upcoming season will follow from Coach Schultz. Physical Exams will be done in the nurse’s office today between 8:15 – 12:30. Passes will be distributed during first period and students should arrive promptly in the nurse’s office for your scheduled time. If it interferes with a test, please reschedule your time with Mrs. Shannon. Other students should only visit the nurse between 8:15 – 12:30 for schedule medications, schedule procedures or significant illness. End-of-the-year awards are just around the corner, and the 25 students in each grade who have earned the most Kennett Square‘s will be recognized as the pride student of the year. Tomorrow, Friday, May 25, will be a power up day, which means every Kennett Square earned is worth double. Be on your best behavior today and tomorrow and try and earn a power up Square before the end of the year awards are decided. Good luck and show your Kennett pride! Any 8th grade student interested in trying out for the Kennett High School Golf Team, please sign-up in the main office. Sign-ups will run through Thursday the 24th. More information and a meeting as to the upcoming season will follow from Coach Schultz. This week on Wednesday, Thursday, and Friday we will have the 5th graders visiting from each Elementary school. 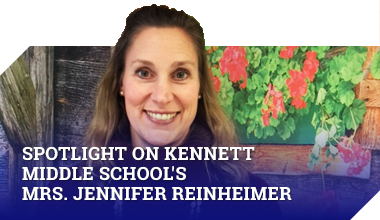 Be sure to show your Kennett Pride. If you were one of the 8th graders that was invited to visit your Elementary School in June, please be sure to turn in your signed permission slip to Mrs. Krieger in the Guidance Office. The deadline is Friday, May 25th. Thank you. This is a reminder to all algebra students in sixth, seventh, and eighth grade… Monday and Tuesday of this week please report directly to the small gym area upon arrival. There you will get in line based on your last name and check in for testing. Testing will last periods 1 through 4. To all students and staff traveling near the small gym area… please be mindful that over 100 students are taking an important exam on Monday and Tuesday. The small gym, library, and library classroom are unavailable but the locker rooms and F wing are still accessible. Please return your uniform in a bag to the office with your name as soon as possible. Congratulations to all of the singers and instrumentalists who sang and played in this week’s amazing concerts. We are so proud of your performances! Today, Friday, May 18th, is the last day to check out books from the library. The library will be closed beginning Monday May 21st and will not re-open until Tuesday May 29th. Make sure you have enough books to hold you through the week. Attention all 7th and 8th grade girls lacrosse players: your uniform and practice pinnie needs to be returned to coach Heather in room C101.